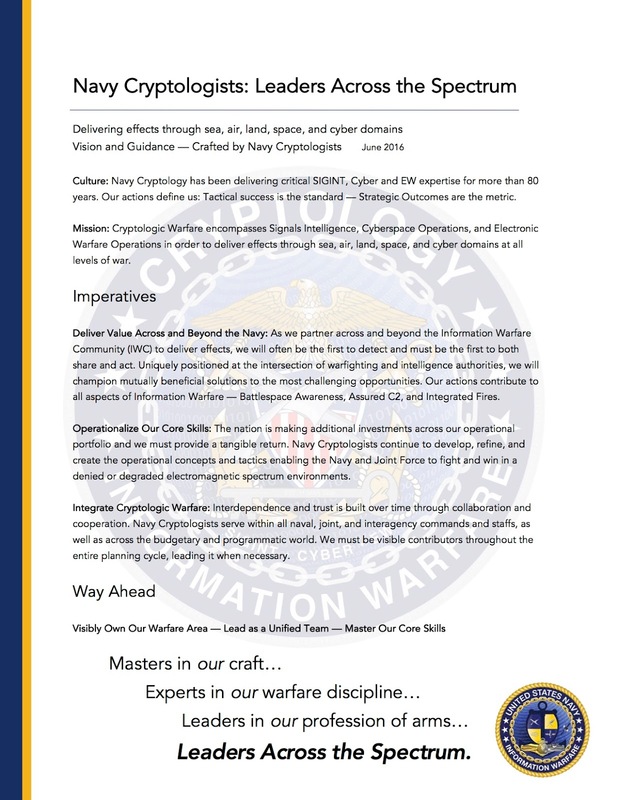 As promised on this blog on March 11th, 2016, VADM Jan Tighe, our community leader, has delivered an updated version of the Navy Cryptologic Community’s vision. Please find below the executive summary. The term cryptology is derived from the Greek kryptós (“hidden”) and lógos (“word”). Cryptology is the a branch of knowledge concerned with data communication and storage in secure and form. It encompasses cryptography and cryptanalysis. Cryptography (from the Greek kryptós and gráphein, “to write”) encompasses the area of key-controlled transformations of information into forms that are either impossible or computationally infeasible for unauthorized persons to duplicate or undo. Cryptanalysis (from the Greek kryptós and analýein, “to loosen” or “to untie”) is the science (and art) of recovering or forging cryptographically secured information without knowledge of the key. 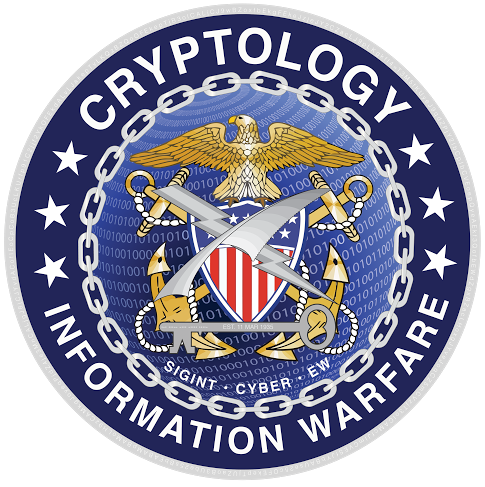 Based on dictionary definitions, the term “cryptology” does not encompass Electronic Warfare (EW), Electronic Intelligence (ELINT), or information operations in the cyber domain. This community needs to find a word that encompasses all components of this branch of knowledge. As you probably know, I agree with the use of Cryptology. It ties us to the past as we move ahead into the future. We have created a new term, Cryptologic Warfare, and binned three pillars underneath — SIGINT, Cyber, and EW. No one is redefining the term Cryptology. Instead, we are leveraging it as we better define what we DO. The creation of the new term Cryptologic Warfare and binning SIGINT, Cyber, and EW under that banner does in fact imply that SIGINT, Cyber, and EW are subcomponents of this new warfare area. In effect, it redefines the term Cryptology. It would make more sense for cryptology to be depicted as a pillar under SIGINT. Recommend the Navy adopt the term Signals Warfare. The word signals has been used since at least the 1920s to define a category of intelligence, e.g. Signals Intelligence or SIGINT. In 1952, the National Security Agency was created for the collection and analysis of information derived from foreign signals. The term “signals” is broadly accepted in the national security lexicon to include communications, electronic, and foreign instrumentation signals. Recommend the top layer of a depiction be Signals Warfare, and that layer is supported by three pillars: SIGINT, EW, and cyber. Cryptology would be a pillar under SIGINT. I would add that one might place Signals Warfare under the heading of Information Warfare, a predominant warfare area in the Navy. Words matter. Within the Navy we can use internal jargon using words that don't describe what they name. But to do this in a joint and Public Affairs environment is counterproductive. I chose the word “counterproductive” because of what it means. Cryptology, however, is not the appropriate word here. A better term would be Electronic Warfare Officer or Electromagnetic Warfare Officer, since what we really do is more closely related to the things you can do with electromagnetic phenomena. Signals Warfare is better than Cryptologic Warfare, but still seems a bit far off to me. The signal is the information conveyed. But in the case of EW jamming, it is not the information, but rather the physical energy that is the weapon. Some cases of warfare would involve the signal, but all would include the physical energy, so why choose “Signals Warfare” when you could choose “Electromagnetic Warfare”?